Outgoing press secretary moving to Ministry of Foreign Affairs. As of 1 July 2018, the office of Prime Minister Dr Keith Mitchell will be having a new Press Secretary, because the current holder of the position, Kisha Alexander-Grant, will be moving to the Ministry of Foreign Affairs. “I requested that change, I need a different challenge,” said Alexander-Grant who disclosed that her request to change ministerial task was made following the return of the New National Party (NNP) to office on 13 March 2018. The new press secretary will be former Grenada Broadcasting Corporation (now Grenada Broadcasting Network) television anchor and reporter, Philomena Robertson who also served the Government of the British Virgins Islands (BVI) in its Financial Services Implementation Unit. Alexander-Grant said that it took some months for Robertson to agree to accept the job. “The Prime Minister and I have been recruiting her for some months and now is finally here,” said Alexander-Grant on the New National Party daily radio programme which is aired online and on local radio stations. She also reminded the audience that her academic qualification is in diplomacy and she has worked at the Grenada Embassy in Washington. “Diplomacy is my background,” said Alexander-Grant who was appointed press secretary weeks after the NNP won the February 2013 general elections. 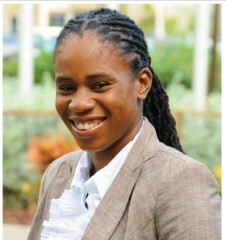 Robertson, according to the BVI forward website, graduated with honours from New York University in 2004 with a Bachelor of Arts in Social Sciences with a concentration in Media Studies. In 2007, she earned her Master’s in Global Affairs from the same university. Robertson began her career in media in 1991 as a radio reporter. Within 4 years, she was reporting for both radio and television and continued to do so until 1998 when she became news producer for the Barbados based Caribbean Broadcasting Union, now Caribbean Media Corporation. Since 2008, Robertson has focused more on the public relations side of the industry serving as Information Officer in the Office of the Premier, PR and Communications Manager at the international law firm, Harneys and most recently as the Information and Education Manager for the Department of Disaster Management. As the Communications Specialist for the Financial Services Implementation Unit, Robertson was responsible for executing all relevant communications functions including the planning, designing, implementation, monitoring and updating of all media platforms utilised by the unit. Heartfelt congratulations to Philomena on your new press secretary position. Gaga would be Ssooooo proud of you. It is my hope that you serve your fellow Grenadians well in this capacity. May God bless you personally,professionally,financially & every sphere of your life!